Every child should have a Christmas Stocking. 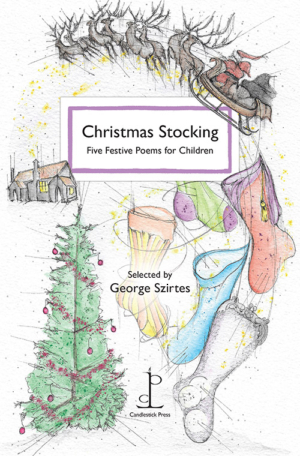 This selection of poems for children has been made by poet George Szirtes and makes a delightful gift – something to read at bedtime as the excitement of Christmas approaches, or to be shared afterwards as a reminder of the laughter and fun. From a trip to the panto (hissing and booing essential!) to a first uncertain encounter with Santa, the poems celebrate the special traditions of Christmas that are relished by children of all ages. George Szirtes is a leading contemporary poet who has won many awards. He is also a grandfather. Poems by Gabriel Fitzmaurice, Walter de la Mare, John Mole, Rachel Rooney and George Szirtes.